SportsFest 2012 took place Sunday, August 19, 2012 in Cary. 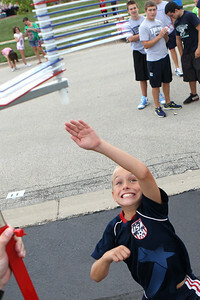 The annual sports and fitness showcase, sponsored by the Cary Grove Area Chamber of Commerce, featured over 50 area vendors and demonstrations throughout the event from local groups. Mike Greene - mgreene@shawmedia.com Chul Lee's Martial Arts Academy member Colleen Fletcher, 15 of Cary, breaks a series of boards with a kick during a demonstration at SportsFest 2012 Sunday, August 19, 2012 in Cary. The annual sports and fitness showcase, sponsored by the Cary Grove Area Chamber of Commerce, featured over 50 area vendors and demonstrations throughout the event from local groups. Mike Greene - mgreene@shawmedia.com Christian Wilhusen, 14 of Cary, jumps to avoid a swing by Chase Jones, 10 of Cary, while participating in a North American Grappling Association booth during SportsFest 2012 Sunday, August 19, 2012 in Cary. 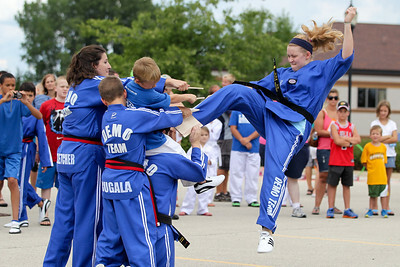 The annual sports and fitness showcase, sponsored by the Cary Grove Area Chamber of Commerce, featured over 50 area vendors and demonstrations throughout the event from local groups. 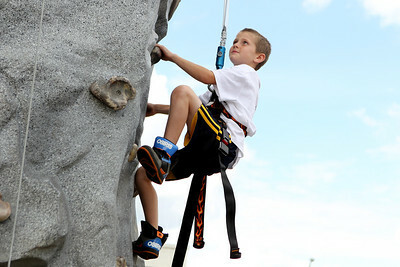 Mike Greene - mgreene@shawmedia.com Logan Mills, 8 of McHenry, focuses on his next hold while participating in a free wall climbing event during SportsFest 2012 Sunday, August 19, 2012 in Cary. The annual sports and fitness showcase, sponsored by the Cary Grove Area Chamber of Commerce, featured over 50 area vendors and demonstrations throughout the event from local groups. Mike Greene - mgreene@shawmedia.com Chul Lee's Martial Arts Academy member Jakub Rugalo, 11 of Cary, jumps to hit a board during a demonstration at SportsFest 2012 Sunday, August 19, 2012 in Cary. 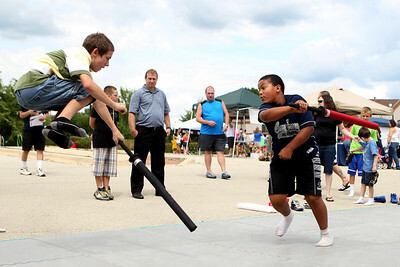 The annual sports and fitness showcase, sponsored by the Cary Grove Area Chamber of Commerce, featured over 50 area vendors and demonstrations throughout the event from local groups. Mike Greene - mgreene@shawmedia.com Ryan Slattery, a Cary-Grove High School teacher and football coach, splashes into a dunk tank during SportsFest 2012 Sunday, August 19, 2012 in Cary. 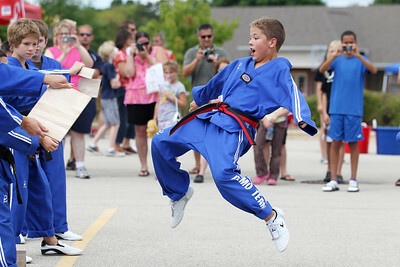 The annual sports and fitness showcase, sponsored by the Cary Grove Area Chamber of Commerce, featured over 50 area vendors and demonstrations throughout the event from local groups. Mike Greene - mgreene@shawmedia.com Garret Baumgarten, 9 of Woodstock, reaches out while seeing how high he could jump during SportsFest 2012 Sunday, August 19, 2012 in Cary. The annual sports and fitness showcase, sponsored by the Cary Grove Area Chamber of Commerce, featured over 50 area vendors and demonstrations throughout the event from local groups. Mike Greene - mgreene@shawmedia.com Zumba instructor Jessica Beuckman, of Lake in the Hills, participates in a flash mob during SportsFest 2012 Sunday, August 19, 2012 in Cary. The annual sports and fitness showcase, sponsored by the Cary Grove Area Chamber of Commerce, featured over 50 area vendors and demonstrations throughout the event from local groups. 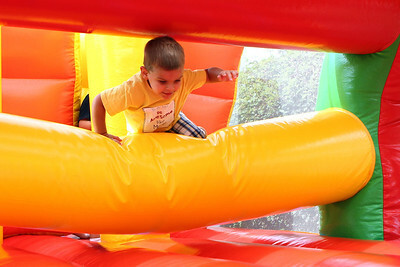 Mike Greene - mgreene@shawmedia.com Benjamin Bernstein, 3 of Cary, climbs over an obstacle in a bounce house during SportsFest 2012 Sunday, August 19, 2012 in Cary. The annual sports and fitness showcase, sponsored by the Cary Grove Area Chamber of Commerce, featured over 50 area vendors and demonstrations throughout the event from local groups. 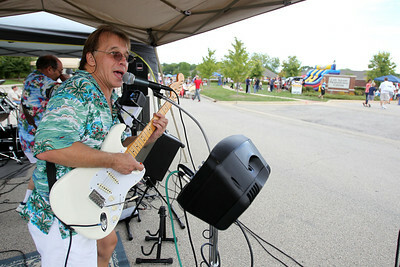 Mike Greene - mgreene@shawmedia.com Scott Jensen, of Echoes of Time, sings for participants at SportsFest 2012 Sunday, August 19, 2012 in Cary. The annual sports and fitness showcase, sponsored by the Cary Grove Area Chamber of Commerce, featured over 50 area vendors and demonstrations throughout the event from local groups. 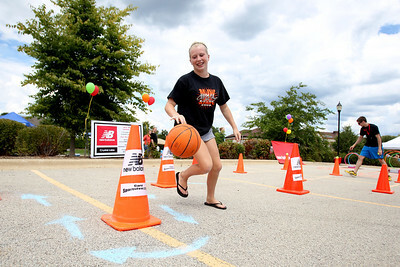 Mike Greene - mgreene@shawmedia.com Cassidy Belpedio, 13 of McHenry, rounds a cone on an obstacle course during SportsFest 2012 Sunday, August 19, 2012 in Cary. The annual sports and fitness showcase, sponsored by the Cary Grove Area Chamber of Commerce, featured over 50 area vendors and demonstrations throughout the event from local groups. Chul Lee's Martial Arts Academy member Colleen Fletcher, 15 of Cary, breaks a series of boards with a kick during a demonstration at SportsFest 2012 Sunday, August 19, 2012 in Cary. The annual sports and fitness showcase, sponsored by the Cary Grove Area Chamber of Commerce, featured over 50 area vendors and demonstrations throughout the event from local groups.